06.08.13 First public version QuakeGuard 1.1 released. Do you want to win precious seconds and minutes in an earthquake? Then QuakeGuard - that is what you are looking for! The application "QuakeGuard" is designed to warn of seismic activity by detecting the "P"-earthquake waves (mainly vertical) with the accelerometer before the destructive "S"-wave (mainly horizontal) to reach your area. You are using application "as is", at your own risk. QuakeGuard is distributed under CC BY-ND 3.0 license ("Attribution-NoDerivs"). Application is distributed in the form of APK-file. 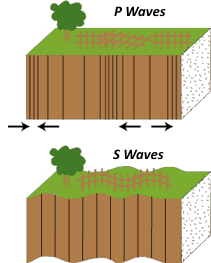 Earthquakes produces two main types of waves: P(pressure)-waves and S(shear)-waves. P-waves are like sound waves - matter in one place pushes against adjacent matter compressing it. 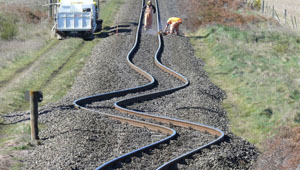 The result is a series of alternating stretched and compressed rock propagating in the same direction as the compression. P-waves can travel through solid and liquid material and move faster than S-waves. P-waves are the least destructive of all seismic waves. S-waves are like waves in a jerked rope - matter moves up and down or side to side. Liquid matter prevents S-waves from spreading. 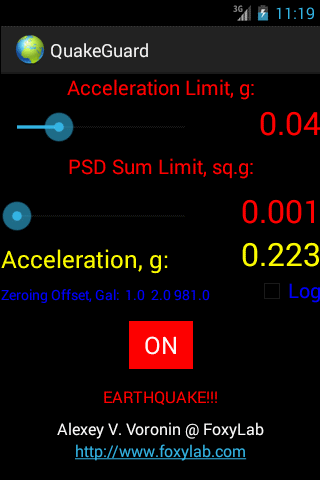 This application is designed to warn of seismic activity by detecting the P-waves (mainly vertical) with the accelerometer before the destructive S-wave (mainly horizontal) to reach your area. If the distance from the epicenter of 200 km, the difference between the arrival at P- and S-waves is about 30 seconds which can be invaluable! In a disaster situation, every second counts toward saving lives. To monitor the seismic situation your device must be placed on a horizontal stationary surface and run the application. When you first run the application accelerometer of your device will be calibrated. Calibration can also be run from the pop-up menu that appears when you press the "Menu" smartphone. After completion of the calibration, by pressing the "OFF" button to transfer the application to control the vertical acceleration of the surface ("ON"), which is located on your device. A running application prevents your device from going to sleep. When exceeding the predetermined acceleration limit data (vertical acceleration) collection begins (128 samples at an interval of 20 milliseconds) for 2.56 seconds. Then, the spectral analysis (FFT) of the data is performed and determines the PSD Sum Limit in the frequency range 0.5 - 15 Hz, typical for "P"-waves. If the PSD Sum Limit are exceeded, a loud siren sound will wake you up. Siren off automatically after one minute after the earthquake (or force it can be turned off by pressing the "ON", this disables the control regime).